My favourite hotel in Taunton is The Castle Hotel – an historic building whose elegant facade is graced by a magnificent wisteria that bursts into flower in late April each year. At one end of the building is a tower, beneath which is an archway spanning a cobbled street. Set into the archway is a wonderful portcullis – a suspended wooden lattice which, in medieval castles, would have been raised or lowered for the purpose of access control. 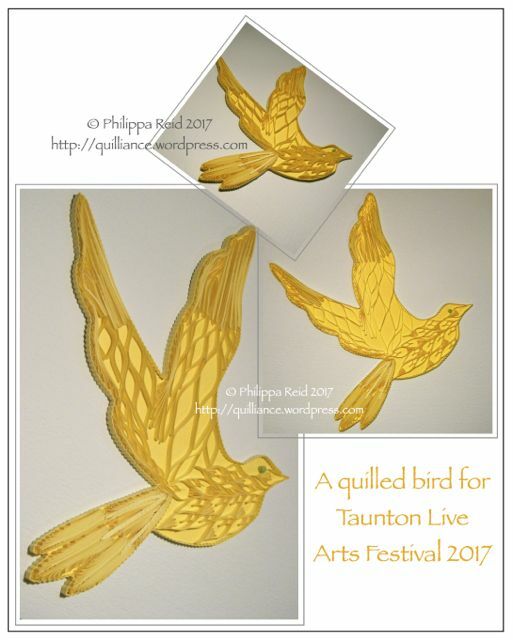 I wanted to make this the subject for my latest quilled collage, which is destined to be displayed in the town during this summer’s Taunton Live arts festival. The central image shows the hotel tower, looking its very best with the wisteria in full bloom. 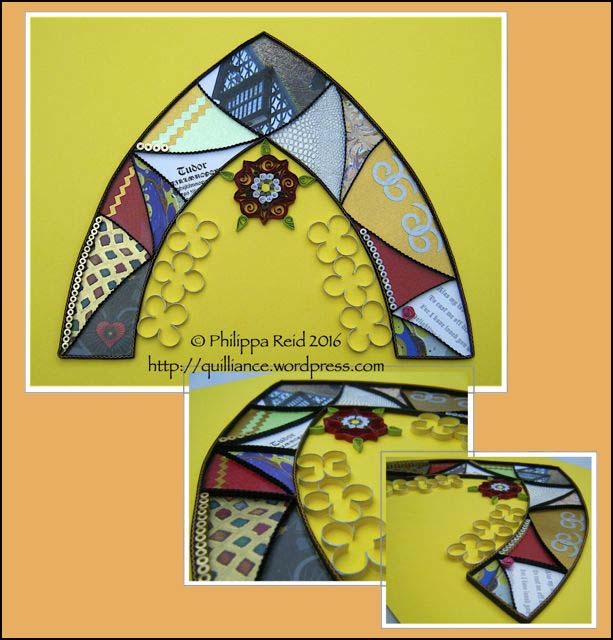 I constructed the shape for the collage using two different types of arch: the outer one is called a ‘shouldered arch’ whose square top allowed me to accommodate the whole of the tower and its castellations. The inner one is a simple curve echoing the shape of the real arch on which the tower is supported, giving me the opportunity to try and represent the portcullis using quilling strips. 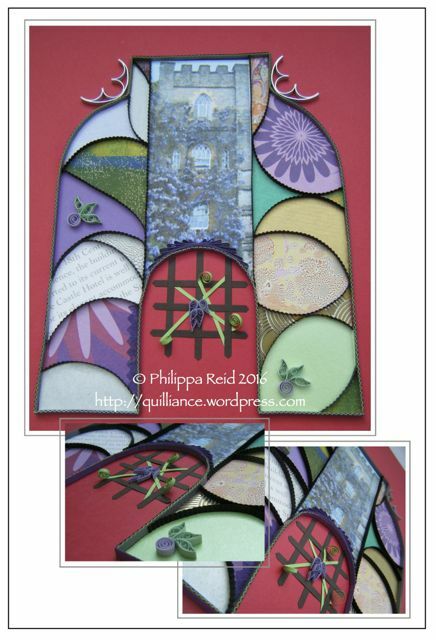 I cannot look at the portcullis without being reminded of a garden trellis, which is why I have used it as a supporting structure for some climbing quilled wisteria. A fitting tribute, I hope, to the beauty of this lovely hotel in springtime. Portcullis will be placed on public display at various locations in the coming months. Should you be interested in purchasing something similar (custom-made), please contact me by emailing quilliancemail@gmail.com or leave a comment below. 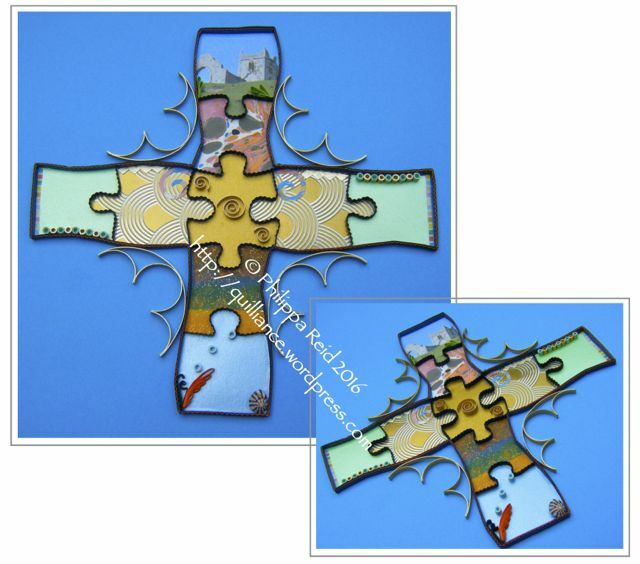 The title of this collage – Tudor Timbers – refers to the picture at the top of the arch which shows one of Taunton’s most iconic landmarks, dating from the 16th century. This lovely half-timbered building stands right in the centre of the town, and always used to be known as the Tudor Tavern. Today it is a coffee shop, but I remember it back in the 1970s as a Berni Inn (oh happy days!! ), with a separate room at the back called the Hangman’s Bar. The hangman in question was the infamous Judge Jeffries who presided over the so-called ‘Bloody Assizes’ in Taunton in the late 17th century. This followed the suppression of the ill-fated Monmouth Rebellion at the Battle of Sedgemoor, in which many local citizens had unfortunately been involved. Despite this somewhat grisly association, the Tudor Tavern remains a potent symbol of Taunton’s history, and seemed to me to be the perfect centrepiece for a Tudor-style collage. I like the way the steep roof of the Tavern zig-zags down towards the right hand side of the arch, highlighted by a subtle patina of moss on the richly coloured roof tiles. 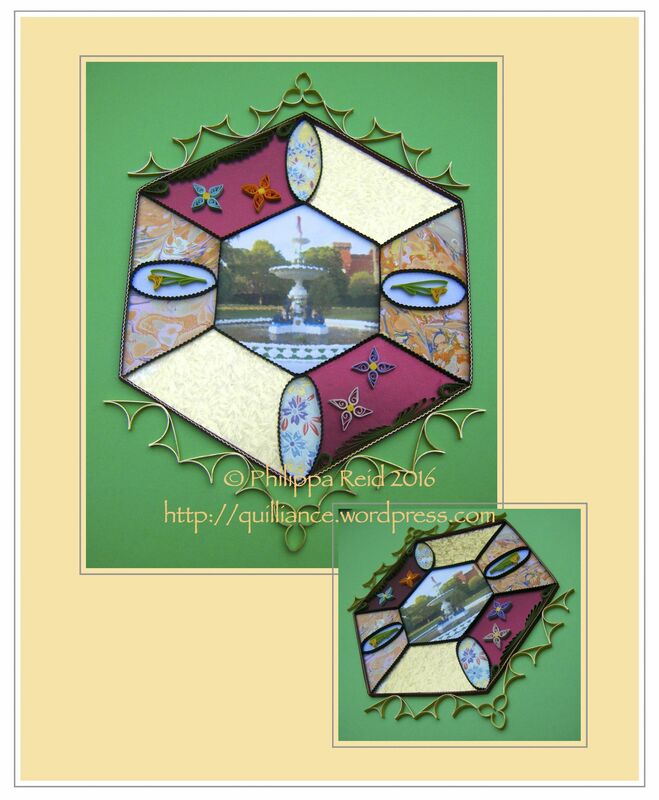 Like my other collages, this piece is divided into brightly coloured black-bordered sections reminiscent of a stained glass window, with quatrefoil tracery shapes positioned on the inside of the arch. 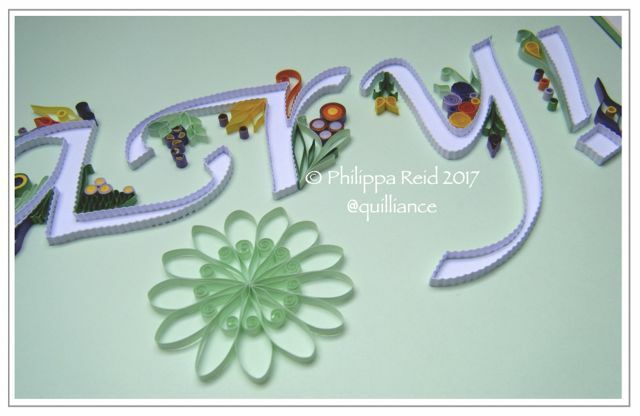 The tracery is constructed from 3mm pastel yellow/silver-edged quilling strips, crowned by my quilled interpretation of a Tudor rose. Two of the window panels contain typography: look closely and you will see that the one positioned towards the lower right includes the opening words to the famous Tudor song, ‘Greensleeves’. 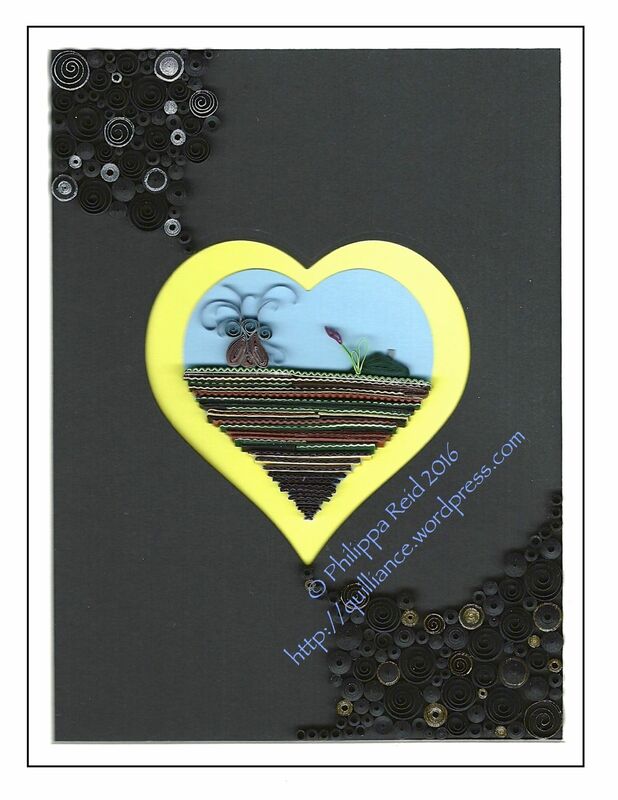 I decided to decorate this particular panel romantically with a folded paper rosebud. 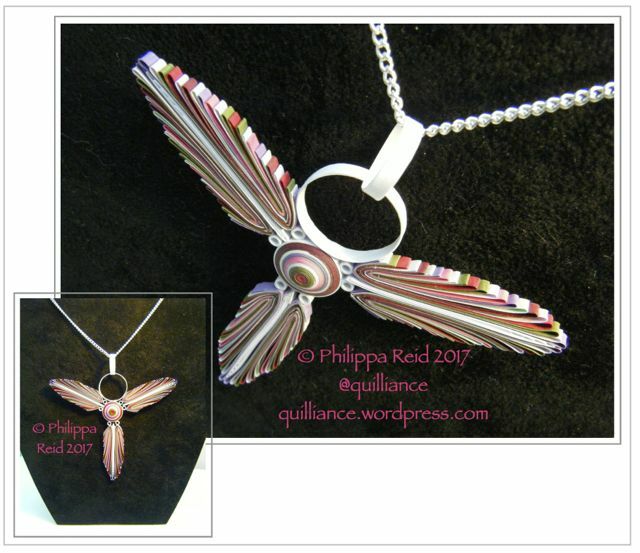 The interlinked silver spirals in the gold panel above it were made with a punch – I had to insert the paper first forwards and then backwards into the punch to form each pair, because the paper I used was only coated in silver on one side. 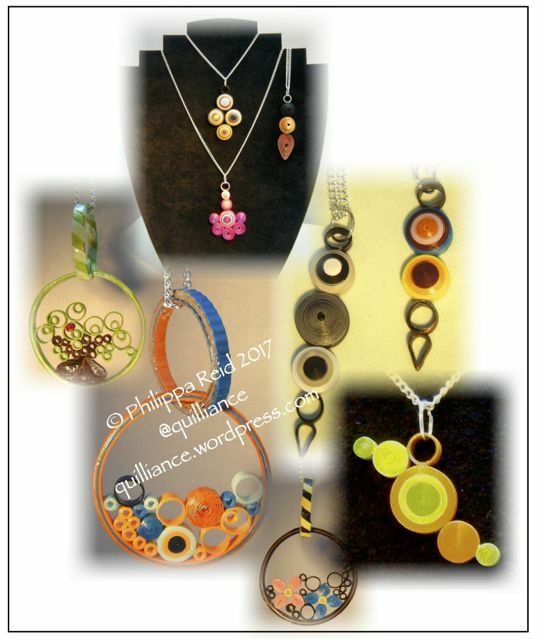 (I’ve had to learn how to think both upside down and back to front when making these collages!) The serrated decorations on the left hand side of the arch were made by cutting paper with pinking shears, and I’ve also included numerous tight pegs made from gold and silver edged quilling strips throughout the design. 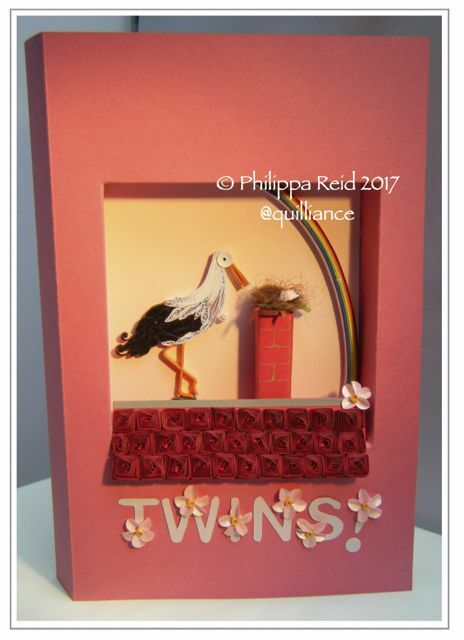 The borders for the arch were created using the quilling strip ‘sandwich’ technique described here. 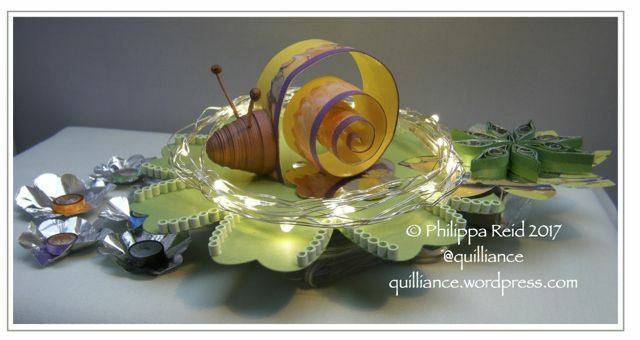 I worked with 3mm (1/8 inch) wide quilling strips, cut into lengths as detailed below. These lengths are necessarily short, since the main body of the finished rose measures only 30mm (just over 1 inch) across – yes, be warned, it’s fiddly to make! However, the pattern could easily be scaled up if required. Make 10 closed loose coils out of 26 mm (1 inch) lengths of crimped white paper, and five tight pegs out of 26 mm (1 inch) lengths of grey paper. Create five pairs of white coils by gluing them together side by side. Then add one grey peg to the base of each pair as shown in the photo. 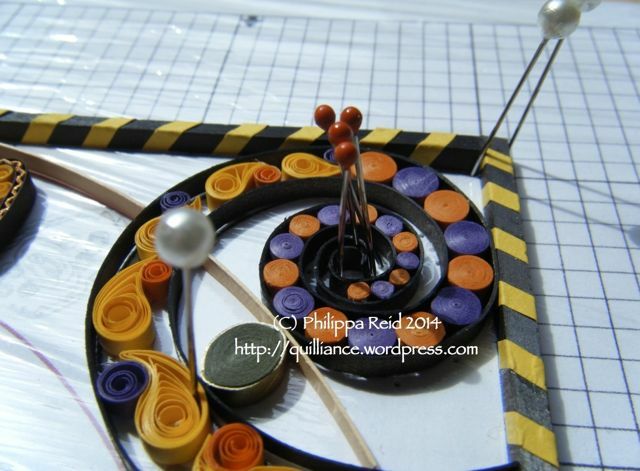 Glue these three-coil sets together in a ring, working over circular graph paper. Use a yellow strip to create a tight peg big enough to fit inside the ring, and glue it in place. 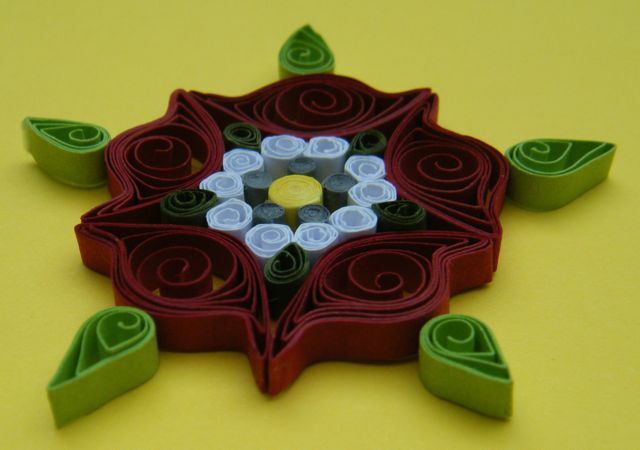 Make 5 teardrops from 3 mm (1.25 inch) lengths of dark green paper and glue these in position between each pair of white coils, pointing towards the centre of the rose. Make 5 crescent/bunny ear shapes (refer to photo) from 225 mm (8 inch) lengths of dark red paper for the rose petals and glue these in position above the white coils, separated by the dark green teardrops. Glue the tips of each petal together. Make 5 teardrops from 3 mm (1.25 inch) lengths of lime green paper and glue these in position as shown in the centre of each red petal. If you use this pattern and post a photo of your Tudor rose online, I’d be grateful if you could please include an acknowledgement to me and a link to this blog post – thank you. 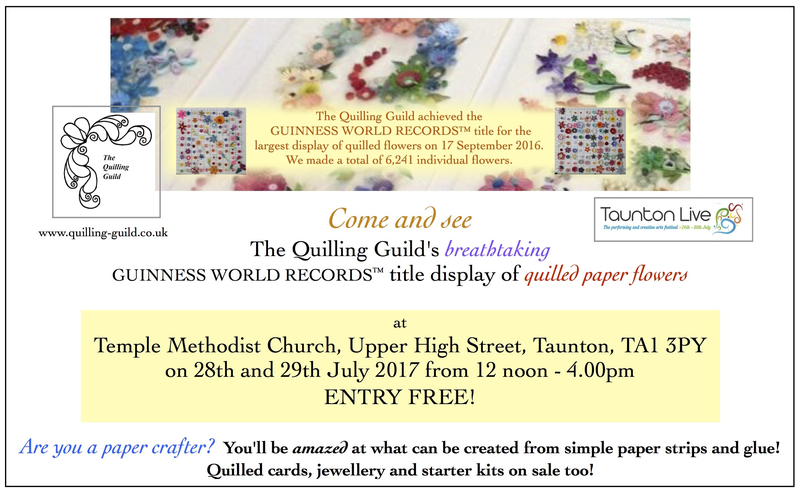 Tudor Timbers will be placed on public display at various locations in the coming months, including the Taunton Live 2016 arts festival. Should you be interested in purchasing something similar (custom-made), please contact me by emailing quilliancemail@gmail.com or leave a comment below. 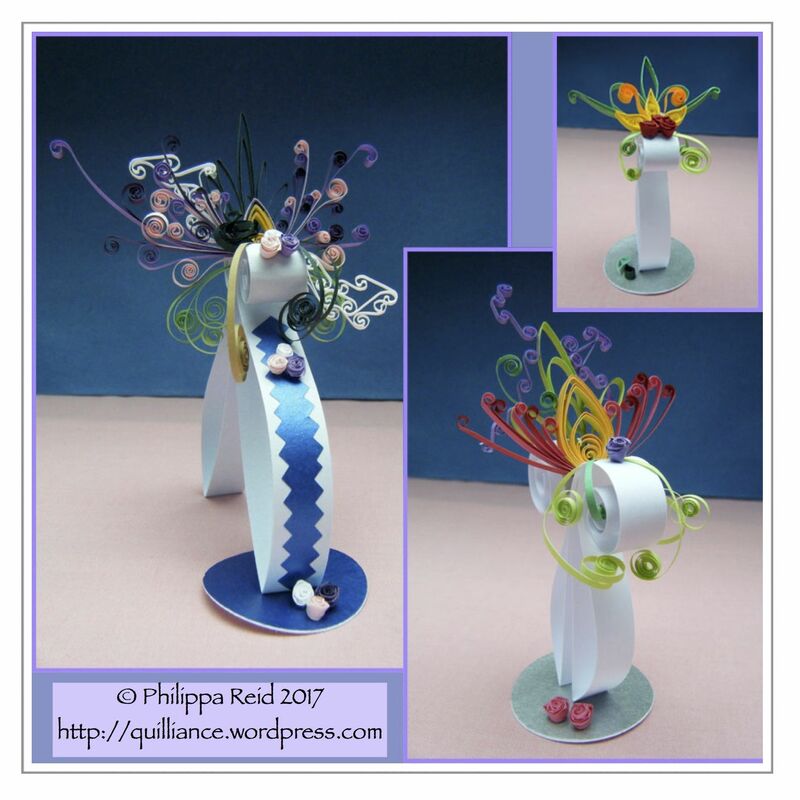 Now that the Quilling Guild‘s competitions for 2015 are over, I can finally share with you my ‘fantasy octopus’ which is pictured here. 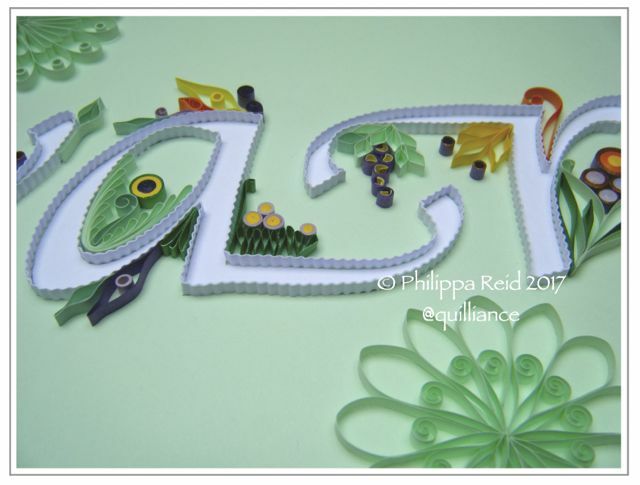 This piece comprises literally thousands of quilled pieces, which took me well over six months to complete and assemble! 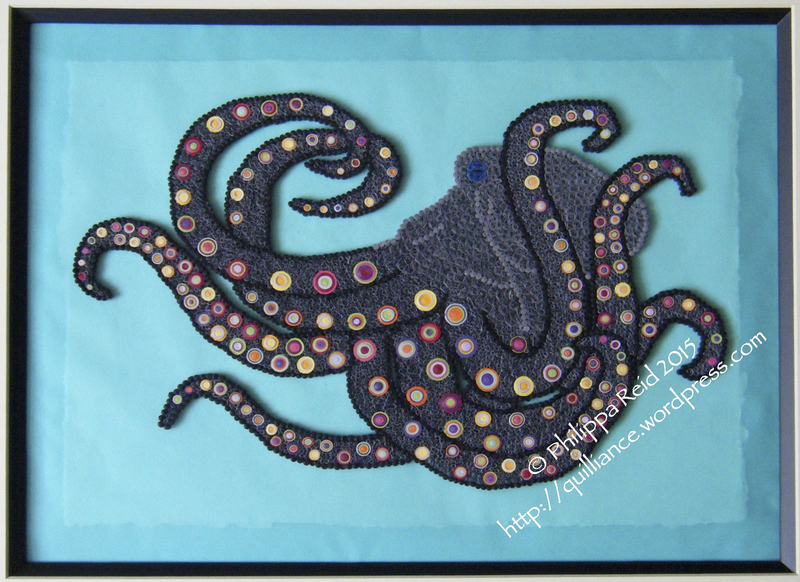 The shape of the octopus is bordered with tiny solid coils (all fastidiously made without holes in the middle! ), while the grey infill pieces are a combination of tiny ‘S’ shaped open coils and mini vortexes. The suckers are all solid coils made using sequential permutations of two carefully chosen sets of colours. They vary in size to reflect the pulsating movement of an octopus when it swims. On some tentacles two rows of suckers are showing, while on others there is only one row; this reflects the way the octopus constantly rotates its ‘limbs’ as it moves through the water. 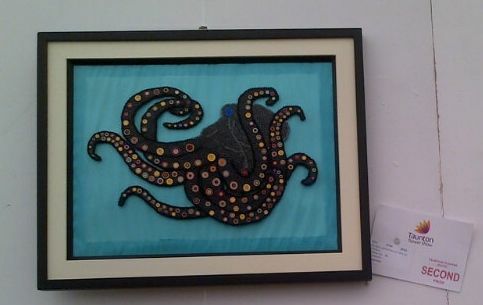 I mounted the octopus on a multi-layered ‘mat’ of specialist papers to create a semi-transparent watery effect. This was accidentally enhanced when the piece was on public display in a marquee earlier this year, where high humidity and condensation produced unintentional ‘ripples’ in the background water in an unexpected act of serendipity!! 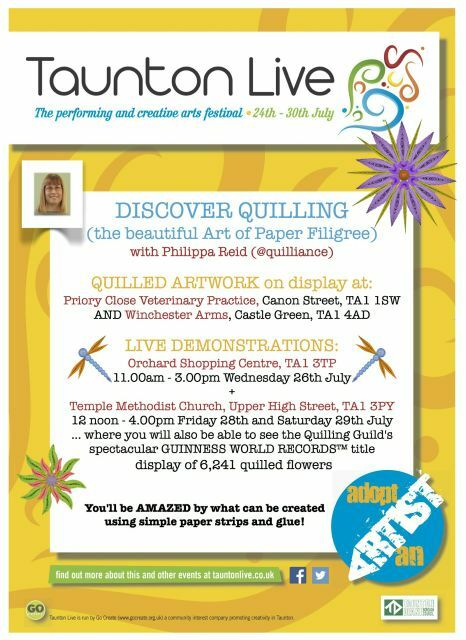 The photo you see above was taken BEFORE the marquee experience, which occurred when I entered the octopus into a competition at the highly prestigious Taunton Flower Show in August. 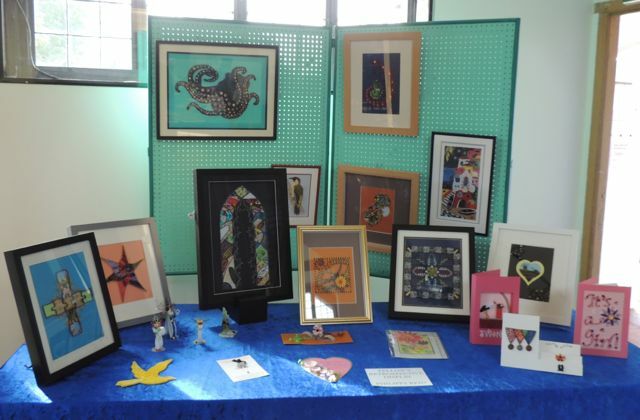 I’m delighted to say that the piece received an award at the show, which was especially gratifying considering that it was judged up against pieces made using many other ‘mainstream’ craft techniques such as embroidery and cross-stitch. Below you can see a photo of it at the show, in its ‘rippled’ state – which I now consider to have been a very ‘happy accident’! 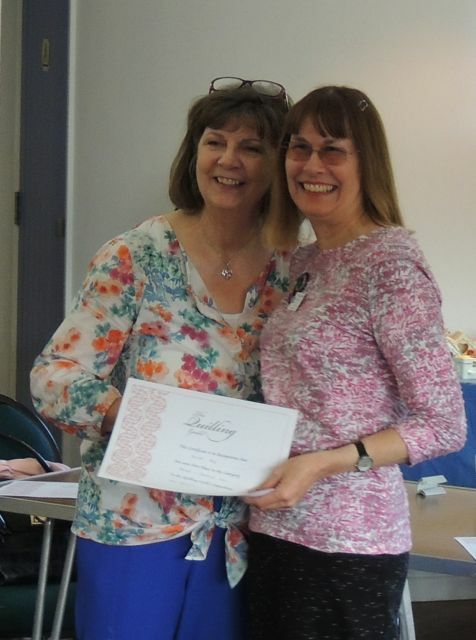 I have just returned from The Quilling Guild’s fabulous AGM and Display weekend in Dereham, Norfolk, and am still buzzing with excitement over the fact that I received THREE awards for one of my competition entries!! 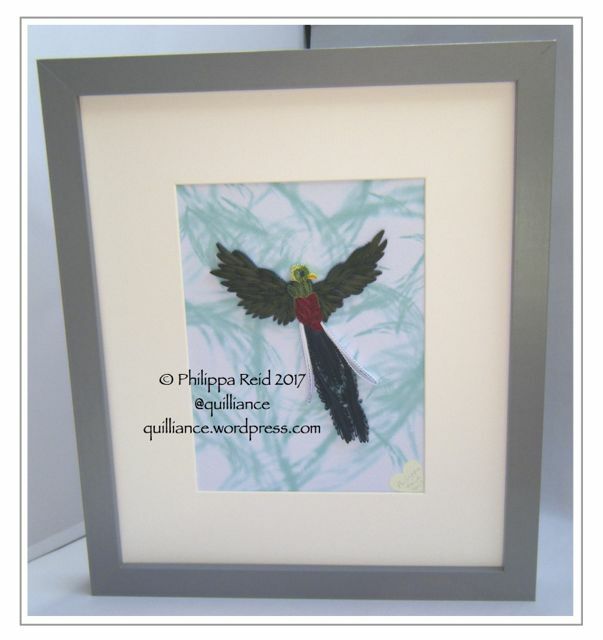 This framed piece, which I call ‘Bordering on Antiquity’ is one of the ‘secret’ pieces which I had been working on during all my months of blogging silence last winter/spring – finally, I have the opportunity to share it with you here! … and I simply could not feel more proud. 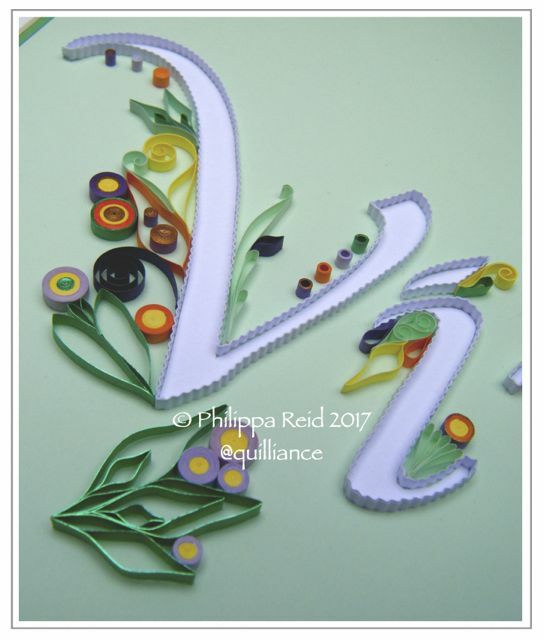 This piece was designed to explore some of the border decoration techniques seen in antique quilling and bring them together in a modern design. 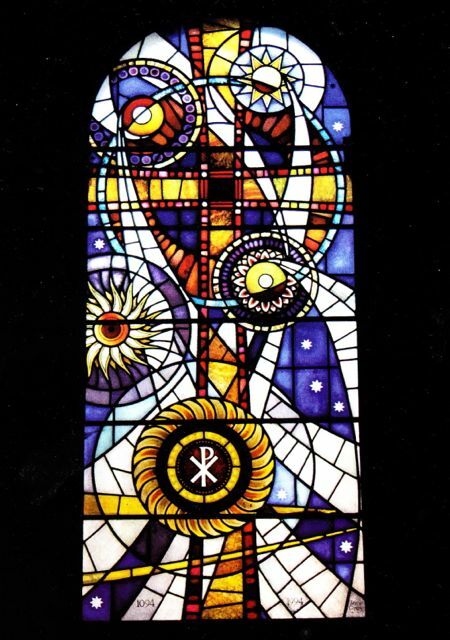 My inspiration came from an interest in the concept of overlapping/interlocking circles and, in particular, a modern stained glass window seen in Chichester Cathedral (shown here) whose design I very much admire. 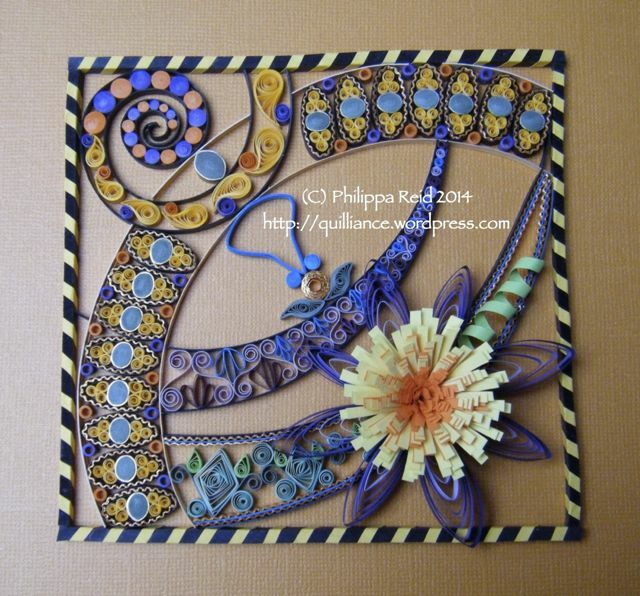 I wanted the background for my design to be a rich gold colour, and this influenced my choice of bright, complementary colours for the quilling which I wanted to ‘jump off the page’ as if lit from behind (rather like the stained glass window). 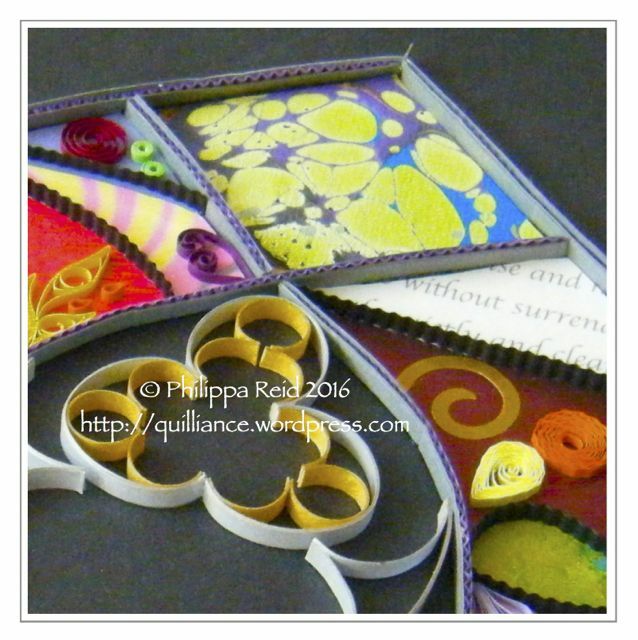 The borders for the circle sections were hand-cut from light card which I knew would hold its shape after being curved to the necessary radius. 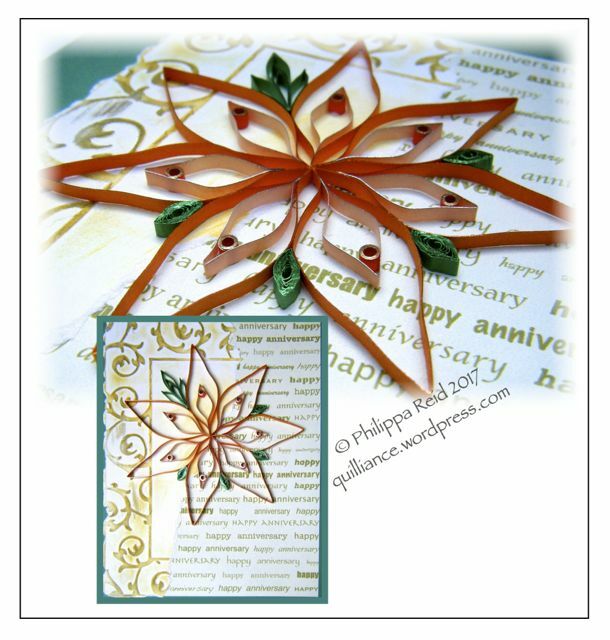 The card I chose for the brown circle borders is semi-metallic with a slightly bronzed effect to complement the sparkling metallic edges of some of the quilled sections. 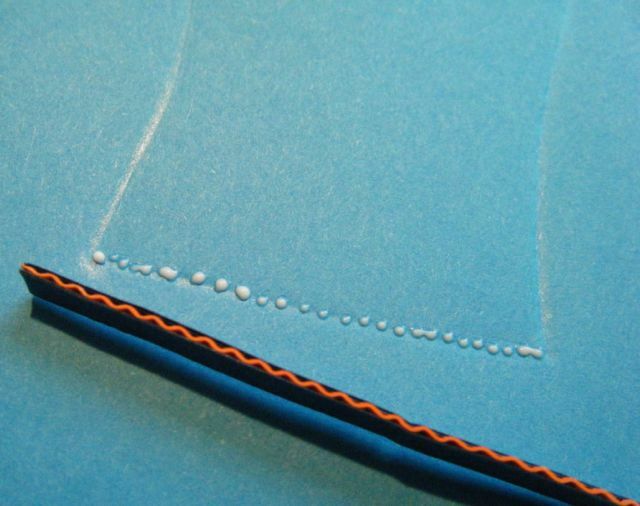 With the exception of the fringed flower petals, all the strips used in this project were 3mm in width. I began by creating some overlapping circle and spiral shapes on my computer, set within a square border. 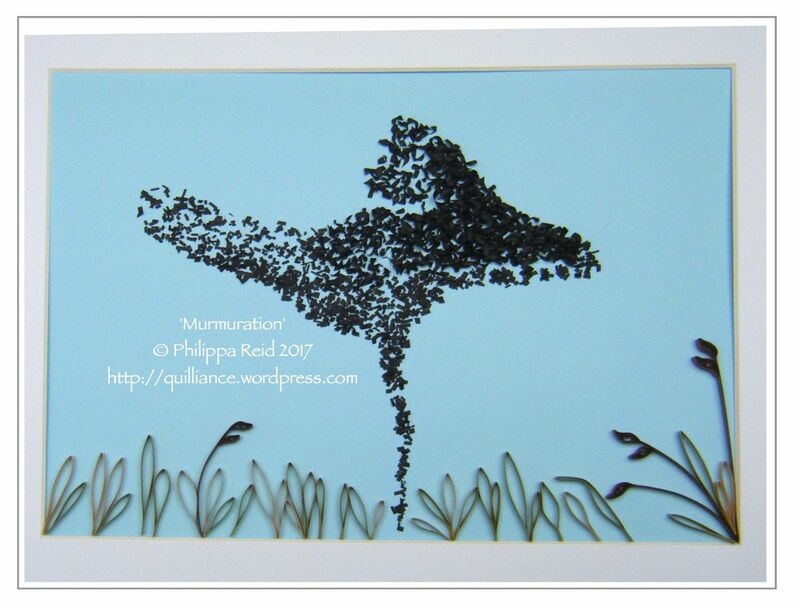 I printed this out and placed it under clingfilm on a mounting board into which pins could be inserted. To delineate the square border, I ‘bandaged’ and cut to size four batches of strips which were glued together at the corners and held in place with pins. I then cut and curved the cardboard strips for the circular and spiral sections, gluing them into position and securing with pins. 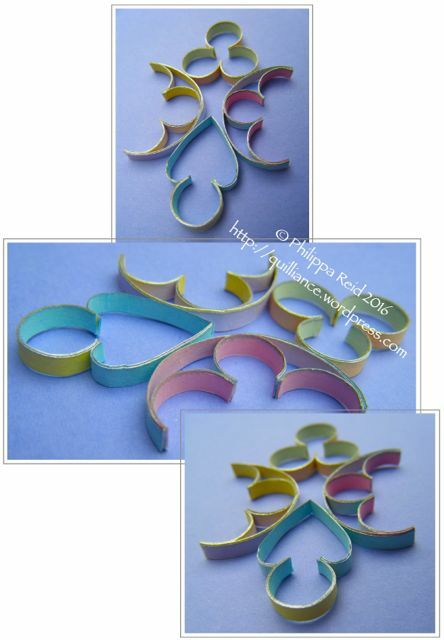 These marked out the various sections which I wanted to fill using techniques seen in antique quilling. Spiral: tight pegs and an alternating pattern of closed loose coils and curved teardrops, seen in the 19th century instructions for Mosaicon. 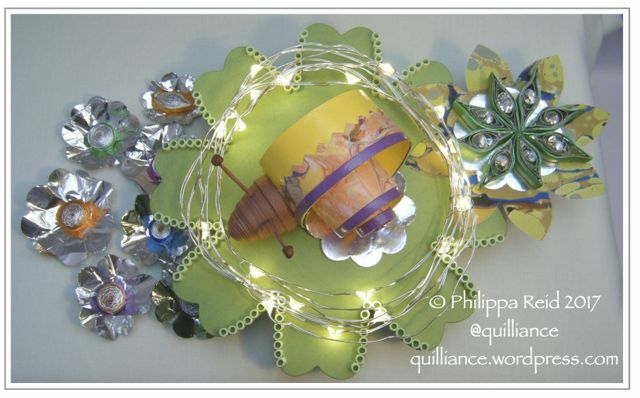 Border of oval ‘medallions’ made using shaped tight pegs edged with gold, closed loose coils and an outer ‘sandwich’ edge comprising plain and crimped (metallic) strips. The medallions are separated by ring coils. 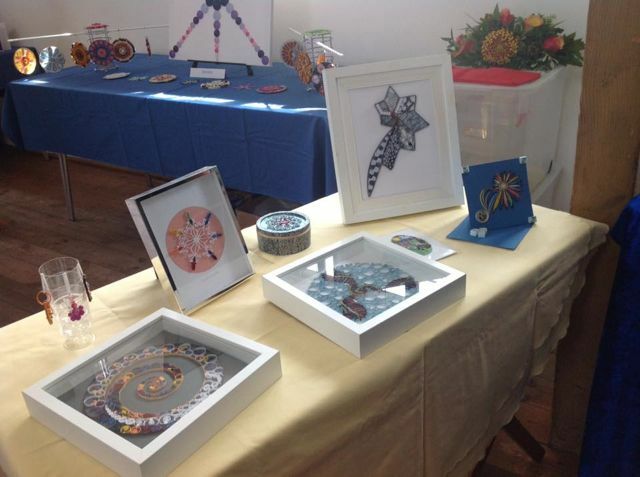 Use of such medallions is described in Brenda Rhodes’ ‘History of the Art of Quilling’ as an 18th century technique. Shaped ring coil joined to tight pegs and two leaf shapes, leading the eye to the central point of the design. The shaped ring coil is another example from the Mosaicon instructions. 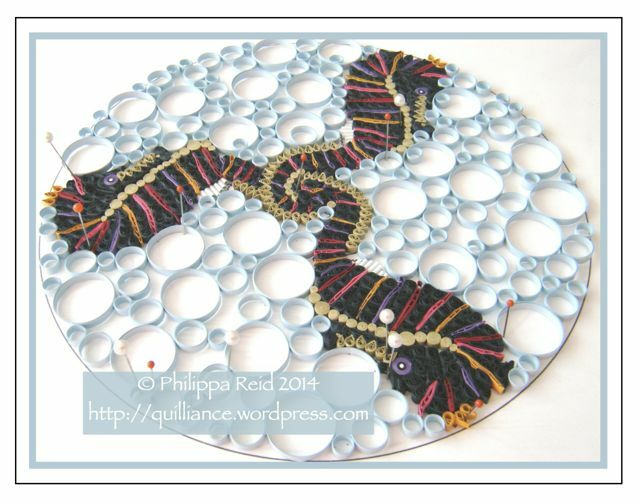 Border of ‘S’ coils and huskings following a suggested border design which also comes from the Mosaicon instructions. Border comprising open coil ‘cherries’, vortex coils and teardrops, spaced using closed loose coils – my own invention – inside a ‘sandwich’ of plain and crimped metallic strips. Pom-pom style fringed flower made by overlapping sloping strips of orange and yellow paper, with three-colour wheatear petals and a green ‘tendril’, mounted on a tight peg to raise it above the level of the circular borders. The main challenge encountered when making this piece was scaling the border components to fit reducing-width curves, achieved by careful experimentation! 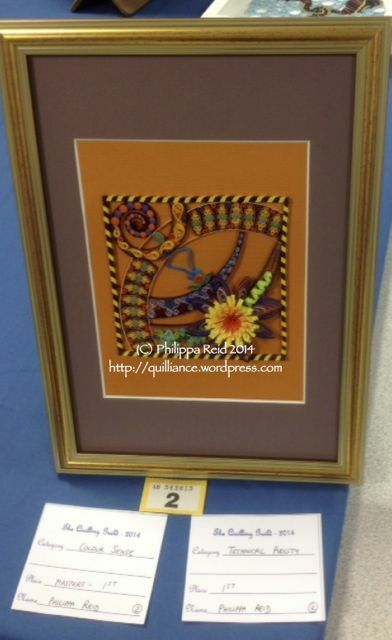 I was pleased with the way this piece turned out, but never dreamed that it would achieve such success in The Quilling Guild’s competitions. It just goes to prove, once again, that you should always expect the unexpected!